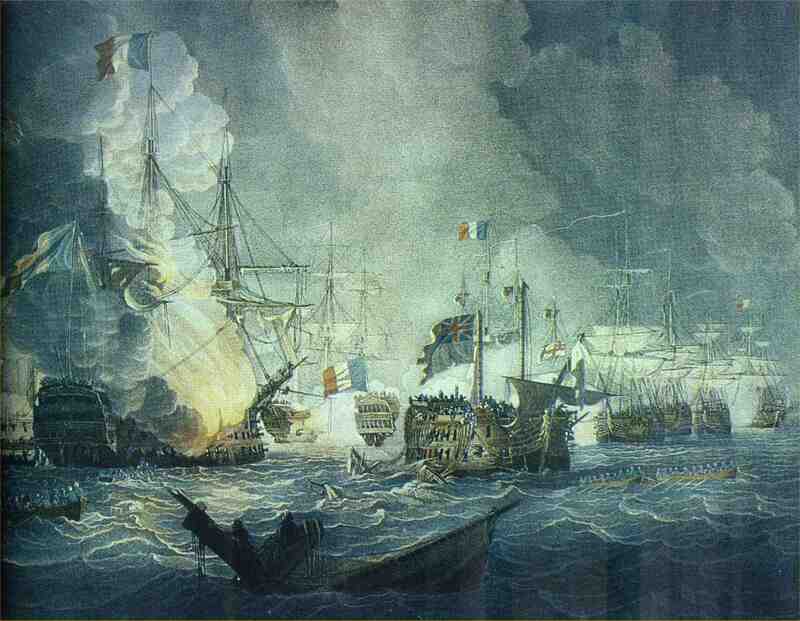 In this detail from an aquatint by Thomas Whitcombe for Jenkin's Naval Achievements of Great Britain, Bellerophon (right) has set a spritsail to further distance herself from the blazing L'Orient. Click on the image for a wider view. As the inevitability of L'Orient's destruction became apparent, both sides took steps to minimise the damage from the explosion that they knew must come. Gunports were closed, magazines secured, sails handed down and any accessible surfaces sluiced with water. The Tonnant, Heureux and Mercure all cut their cables, while towards the rear Timoleon, Guillaume Tell and Genereux let out cable to drift further downwind. On the British side the Alexander also cut her cables, but Captain Hallowell of the Swiftsure felt that he was already in the best position to avoid damage as the worst of the blast would pass over his ship. In case some of the rest of the crew did not share his confidence (and tar was melting between the planks of his ship so intense was the heat !) he posted sentries to stop anyone releasing the cables. At around 10:00pm the flames reached the aft magazine and L'Orient blew up with a shattering explosion, visible over 10 miles distant and heard far inland. A stunned silence fell over the Bay. Flaming debris showered both Franklin and Alexander, but their crews were able to extinguish the flames. Benjamin Hallowell's confidence in his ship's position was indeed justified, as Swiftsure was only hit by two large pieces of timber which did little damage. One of these (part of L'Orient's mainmast) was converted by the Swiftsure's carpenter into a coffin, which Hallowell presented to Nelson "so that when he tired of this life, he could be buried in one of his own prizes". Nelson was delighted with this gift, and kept it in his cabin where it served as probably the ultimate in after-dinner conversation pieces.